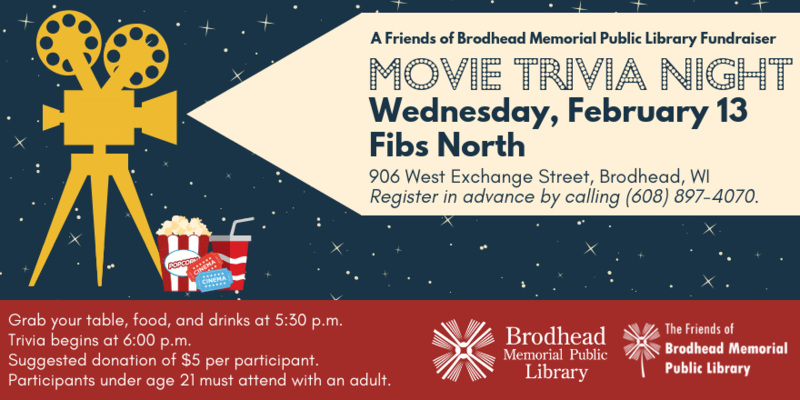 Join the Friends of Brodhead Memorial Public Library for their next quarterly trivia night! Our theme will be Move Trivia, with questions covering various genres and decades. Please call the library at (608) 897-4070 to register in advance. Space is limited. Onsite registration will be available if space allows. Trivia will begin at 6:00 p.m. There is a suggested donation of $5 per participant. Funds collected will be used to support library programming and materials. Participants under age 21 must attend with an adult. No cell phones or other devices that can access the Internet may be used during game play.